Posted on Sat, Feb 11, 2012 : 3:21 p.m. The University of Michigan plans to update its IM Building and the Central Campus Recreation Building, according to a report in the Michigan Daily. U-M has hired consultants, and it's also working with a student panel that is advising officials on what types of changes the recreational sports facilities require, according to the report. Among the options, U-M President Mary Sue Coleman said, is a student user fee to fund the upgrades. Mon, Feb 13, 2012 : 1:03 a.m. I am a little shocked at this. I was a student at UM in the 70s and have used the facilities ever since, regularly. I have noticed none of the conditions mentioned here, and always felt the facilities were great. CCRB and the IM building have been upgraded. And yes, I have seen other schools rec buildings. When I saw what I felt was way over the top, I figured it may be that many schools have to lure students to fill their enrollment needs while UM turns applicants away. I suppose if the students want to pay extra, go for it. Sat, Feb 11, 2012 : 11:22 p.m.
A Student Fee to pay for an upgrade to facilities that should have been done 20 years ago (CCRB) and 40 years ago (IM Building)?!?! How about take that $3 million dollar gift the NHL is giving UM and applying it to athletics for NORMAL students? Mon, Feb 13, 2012 : 3:32 a.m.
johnnya2 &quot;As for the $3,000,000, from my understanding that money is going to the general scholarship fund.&quot; That may be your understanding. But can you tell me how you were led to believe that? Sun, Feb 12, 2012 : 4:12 p.m.
You're right Johnny. Let them be fat. Sun, Feb 12, 2012 : 3:54 p.m.
&quot;Athletes get brand new study centers at Crisler and the Stephen Ross Academic Building at NO COST to them &quot; Yeah, I suppose the commitment of their time and talent is NO COST. I suppose we should talk to your boss and suggest you should be given room and board and tuition instead of MONEY. By the way, EVERY student pays the activity fee whether they use them or not, so the athletic department actually is paying that fee to the U through the tuition they pay for their athletes. 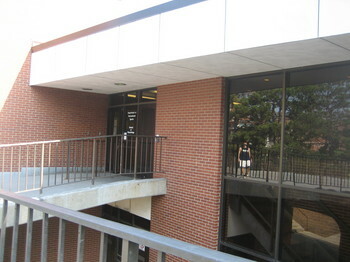 There are 100's of buildings across campus that certain students can not use, they are designated for SPECIFIC students. Why can't an every day student walk into the Miller theater and put on their own production, or walk into the medical school and start doing experiments. As for the $3,000,000, from my understanding that money is going to the general scholarship fund. That does help ALL students. Sun, Feb 12, 2012 : 3:43 a.m.
Word. Athletes get brand new study centers at Crisler and the Stephen Ross Academic Building at NO COST to them and full-tuition paying students are not allowed to even exercise for free?!?! Insane. Sun, Feb 12, 2012 : 1:16 a.m.
&quot;How about take that $3 million dollar gift the NHL is giving UM and applying it to athletics for NORMAL students?&quot; Great idea! I will second that. As much as I enjoy the major sports the athletic dept is off the wall with their spending for the major sports. Sat, Feb 11, 2012 : 10:08 p.m.
&quot;Other construction projects Coleman and Harper addressed include plans for a new School of Nursing building, renovated laboratories on Central Campus and expanded laboratory facilities on North Campus.&quot; TOO much money I guess. I will site another example of the waste at Universities. I worked on the school of architecture on north campus when it was built in the early 70's. The dark rooms in the photography dept ( about 113 if my memory is correct ) all had oak cabinets and nice counters. BEFORE they ever used one of them we were remodeling them. Because the professor that helped design them was no longer there. And the new professor had different ideas about what HE wanted! Most of the professors are prima donna's. Sat, Feb 11, 2012 : 10:04 p.m. I had several email conversations about this with Bill Canning, the Director of Recreational Sports about 4 years ago. At that time I had been traveling the state using the state schools recreational facilities. GVSU, WMU, EMU and MSU had wonderful facilities. The number of staff and local people who would be willing to pay for use of the facility could certainly help defray the cost of building this. They already have a built in audience of 40k students and another 45k staff and faculty in addition to alumni. The CCRB has been plagued by infestation of bugs, and pieces of equipment that do not work including scales, saunas, exercise equipment and showers. I beleive if you want to be the leaders and best you do not have facilities that do not even compare to schools with enrollment 1/10th the size. Sat, Feb 11, 2012 : 9:58 p.m. Yes by all means impose a student user fee! I worked on the Central Campus Rec building from start to finish. And within a couple months of opening there were doors TORN off the hinges. Heavy metal doors! Some of the wanna be jocks that use these places are not much more than untrained gorillas!